The Pro XS Sports 2-in-1 is one of the top ellipticals all around the world. 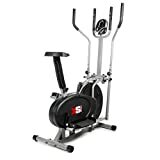 It is a top addition to any gym and any athlete looking to get the best in workout sessions would want to have this elliptical. What you get from this trainer is a solid and robust machine which gives you a proper upper body workout which is as good as the lower body workout. Every feature of the elliptical is designed to provide durability and stability. It has a sturdy and solid look. The XS Sports Pro 2-in-1 Elliptical Cross Trainer is a great piece of home gym equipment because of two reasons. It serves as a cross trainer and an exercise bike. This trainer ensures that you get a 2-in-1 package from just an equipment. Just a single equipment will provide you with a full body workout. The bike is very useful in training the lower body while the cross trainer will build the arms and shoulders. It is sure to leave every user and rider satisfied. It is fitted and designed with all the features to make sure that you get the best out of the fitness equipment. It has adjustable sidebars with pulse sensors, Multi-Function LCD display, adjustable levels of resistance, front mounted flywheel and back peddling features. All the features of this equipment guarantee that it will help to build up the muscles of the entire body. Front Mounted Flywheel: The flywheel of the trainer is mounted at the front of this elliptical to make sure that the machine is properly balanced. Adjustable Levels of Resistance: The trainer is designed to have adjustable levels of resistance. These levels of resistance will help to make sure that riders can maintain the intensity of the workout. It can also help to create a challenge for experienced riders. Multi-function LCD Display: This trainer has a LCD display which helps to record reading such as pulse, time, speed, distance, calorie and even a scan mode. Pulse sensors: This trainer has a unique feature known as the pulse sensors. The pulse sensors help to record heart rate of the bike rider. Durable and impressive design: The XS Pro is designed with a steel frame. It is a lightweight equipment which help to save a lot of space by serving a dual purpose of being either a cross trainer or exercise bike. It has a multi-function LCD console which can be used to monitor the time, distance, calories and scan mode. Every part of the instrument is designed to allow for a great workout session. Ease of Use: The XS Sports Pro 2-in-1 Elliptical Cross Trainer is a fantastic piece of equipment. The cross trainer helps to simulate a natural walking or running environment. It is an equipment which can quite easily be used by different users. Beginners and experience athletes would have no problems in using the equipment. Back Peddling: The trainer can be used in a dual direction. Frond peddling will help to build the front thighs while backwards peddling can help to exercise the hamstrings. This unique feature of the trainer will ensure that the workout session is intense and challenging. It will also help to build up the body properly. Comfort: The XS Sports Pro 2-in-1 Elliptical Cross Trainer will ensure that the workout session is very comfortable. It has wide foot pedals which can fit almost any side up to a max size of 12. It also has an adjustable seat to ensure that the rider is comfort even when working out for long periods. The seat and handlebars are also adjustable to ensure that the rider is able to exercise in the most convenient position possible. Stride bars with pulse sensors: The trainer has stride bars which are fitted pulse sensors to record the heart rate of the rider. This will keep the rider abreast of his or her pulse to ensure they exercise within their health limits. Difficult to assemble: The XS Sports Pro 2-in-1 Elliptical Cross Trainer is a fantastic equipment which can be quite difficult to assemble. The assembly of the trainer may take long periods of time. This can however be overcome by watching tutorials on the assembly of this trainer. The XS Sports Pro 2-in-1 Elliptical Cross Trainer is an excellent addition to any gym. By being a dual-functional fitness equipment, it helps to give a full body workout without having to get two machines. It is suitable for different riders and workout styles, making it a worthwhile investment.